Bombardier Transportation has signed a ten-year agreement to license its low-floor electric tram technology to CSR Puzhen, a subsidiary of China South Locomotive & Rolling Stock (CSR). 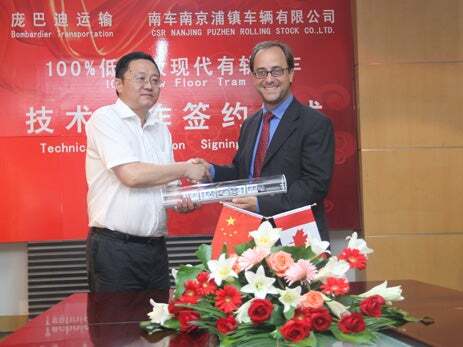 Bombardier will offer CSR Puzhen a license to build and sell low-floor trams in China, including Hong Kong and Macao. The product is similar to the company’s energy-saving low-floor tram, Flexity 2, which was launched last September in Blackpool, UK, and is currently being delivered to Australia’s Gold Coast. Bombardier said it will not actively manufacture vehicles in China, but will support its Chinese partner. The company will also prepare and deliver licensed product documentation, as well as provide training to CSR Puzhen’s staff. The vehicles planned to be manufactured will be equipped with Bombardier FLEXX Urban 3000 bogies and the Mitrac 500 propulsion and control systems. "The vehicles planned to be manufactured will be equipped with Bombardier FLEXX Urban 3000 bogies and the Mitrac 500 propulsion and control systems." A Bombardier joint venture in China will deliver the Mitrac 500 propulsion and control systems, while the Bombardier FLEXX Urban 3000 bogies will be initially provided from its factory in Siegen, Germany. Bombardier China president Jianwei Zhang said: "After many years of intense development of metros, Chinese cities are embracing low-floor trams to complement their urban transit systems." Bombardier has not disclose the financial terms of the agreement but said the agreement will help the company strengthen its local roots in the Chinese market. The company currently has around 3,500 trams and light rail vehicles on order or operating in nearly 100 cities in more than 20 countries worldwide. Image: Under the ten-year licence deal, CSR Puzhen will build and sell low-floor trams with Bombardier technology in China. Photo: Bombardier.